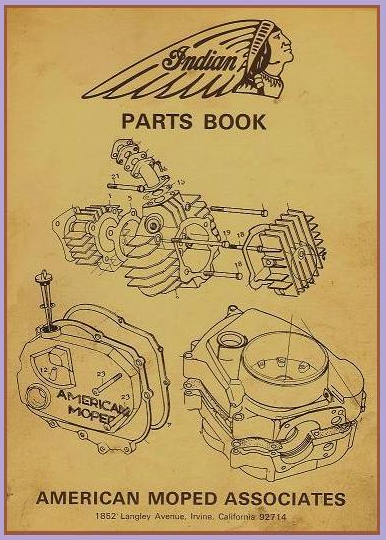 This 1978 parts book has better illustrations than the later ones. So the 1978 pictures are used here. The 79, 80, 81 additional versions are added to the list with a letter suffix after the number, like 7, 7a, 7b etc. 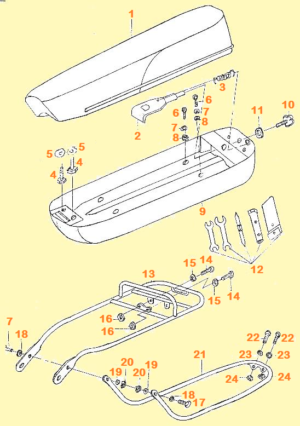 Some of these 1978 picture numbers changed in the 1979 and 1980 parts manuals, so be aware of that if you are using a different Indian Parts Book. This is an over head valve OHV type, not an over head cam OHC. because the cam (timing) chain is in the bottom, out of the way. 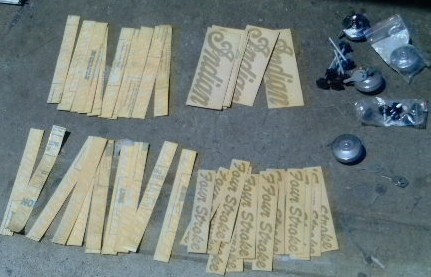 25a 2 $2.00 H662-00-50 (for Tillotson) M5 x ?? Some 1978 Indians had a Tillotson “no-float” (12mm) carb, with choke lever on carb. Some 1978, most 1979 had a Keihin PA-MOA (10mm) carb, with choke lever on carb. 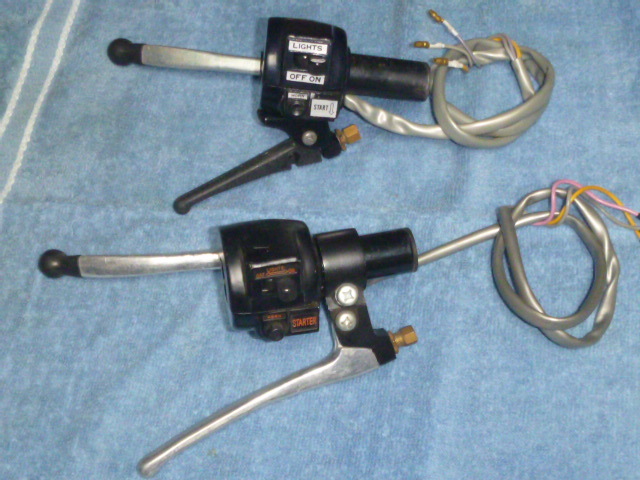 Some ’79 and ’80, all 1981 had a Mikuni H9-10 (10mm) carb, choke lever on handlebar. 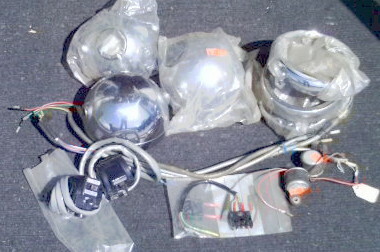 These have an adapter “bell” for the air filter, to interchange with Keihin. These did not work well when they were new with fresh rubber back in 1978. 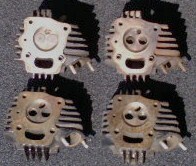 Tillotson carbs were replaced by Keihin, only months after they came out. 40 years later in 2018 their rubber parts, especially the diaphragm, are all stiff. 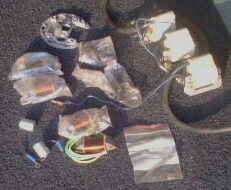 This is the Tillotson carb kit for Indian, Rk-32Hk, available on Amazon. 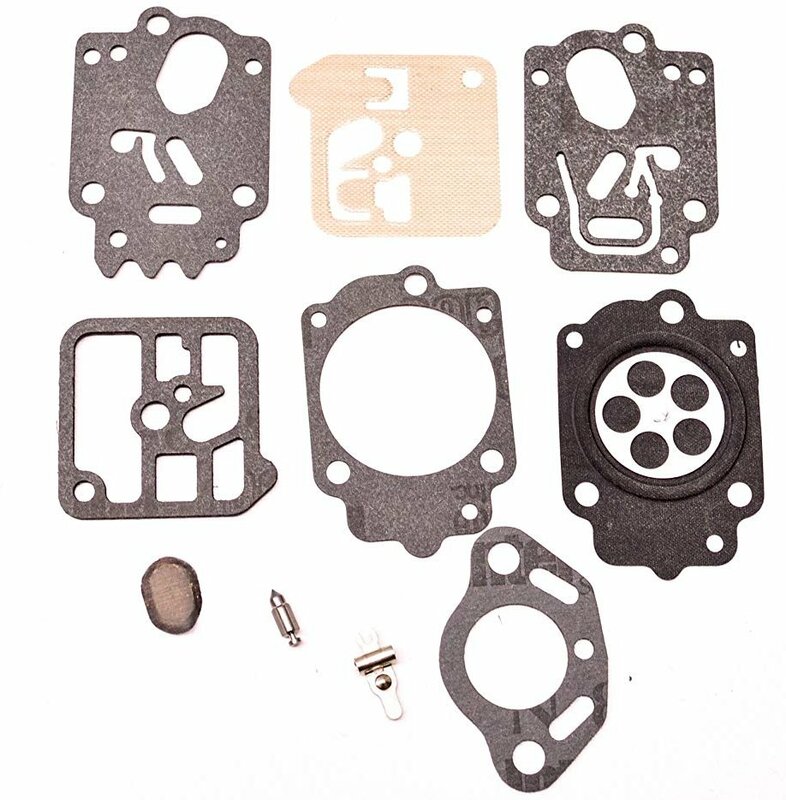 Most Keihin carburetor parts for Indian are now offered in the Carburetor/Keihin section. 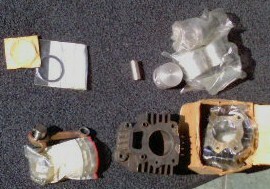 Some Mikuni carburetor parts for Indian are now offered in the Carburetor/Mikuni section. Replacement ones have a special washer. Valve guides: This simple head has no valve guides, just holes. 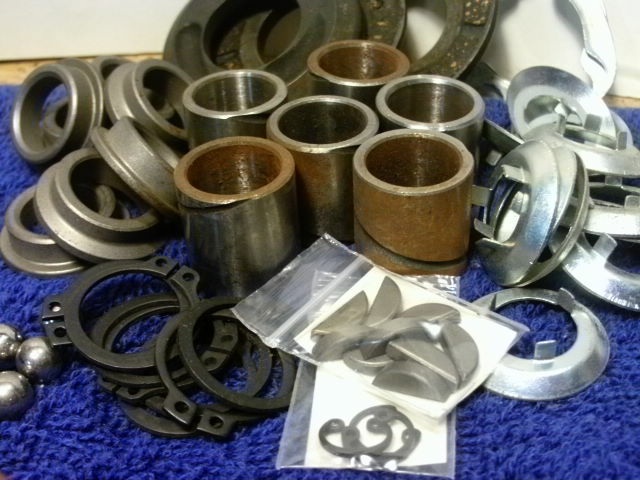 Valve seals: Most did not have valve seals #31. But some did. It was a later upgrade, not in the parts or service manuals. 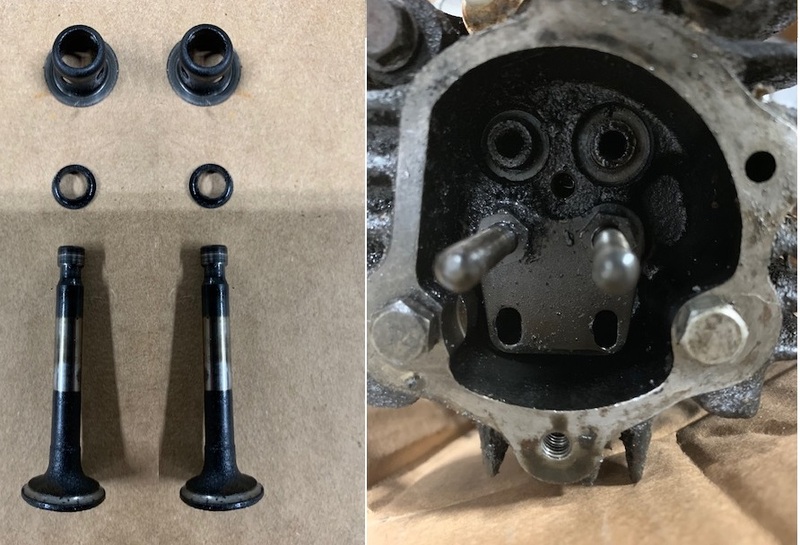 Indian engines with un-worn valve stem holes do not need seals. Indian’s relatives Honda PF50 and QR50 did not have them. 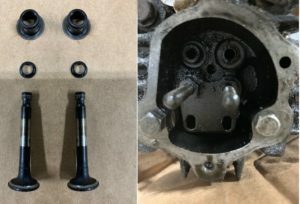 But old engines with worn valve holes do need seals. Oil creeps down the valve stem, and is then burned. 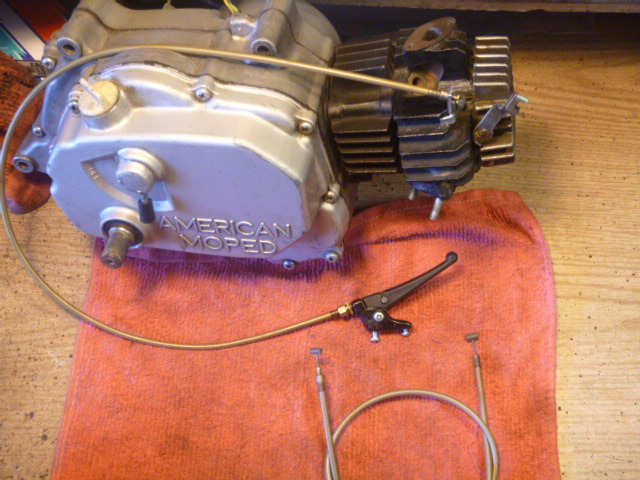 Burned 4-stroke oil smells, smokes, and blackens spark plugs. u13 4 $1.50 H120-00-50 pedal washer Ø20 x 30? 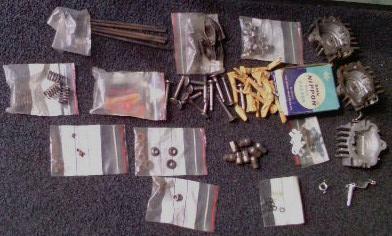 White ratchet “springs” and trans parts. 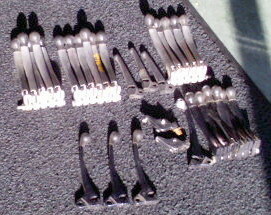 Indian pedal ratchet pawl springs, early spring steel leaf type, often broke. That caused the pedals to freewheel both ways, but the engine could still be push-started. The upgrade springs for 1979-later were silicone rubber. The good thing is those never break. 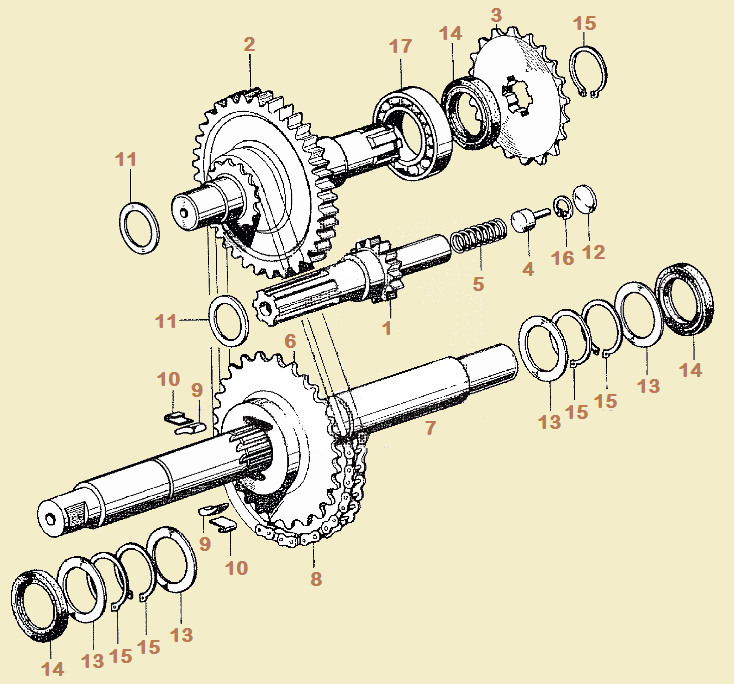 The bad thing is the pedal chain and ratcheting sprocket are trapped in the center of the engine cases, and cannot be serviced without engine removal and complete disassembling, with splitting of the crankcases. 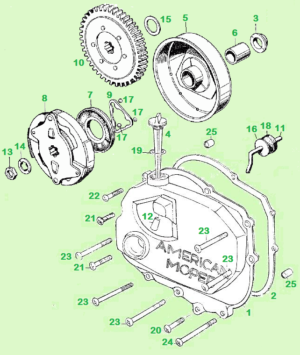 Indian front sprockets fit on many small Honda models, like early Honda 90, but not early Honda 50. They have 6 splines, 17mm inner by 20mm outer diameter. A normal Indian goes 27mph with a 15 tooth. With more power it could go 29mph with a 16T. With less power, or with quicker take-off, it could go 25mph with a 14T. u12 1 none E605-00-50 sprocket pin ∅? x ? u04 1 none E521-00-50 dynamo cover maybe Sachs? u20 1 $1.00 D121-00-50 flywheel washer 10x? u21 1 $5.00 E531-00-50 drain plug M12-1.5x? 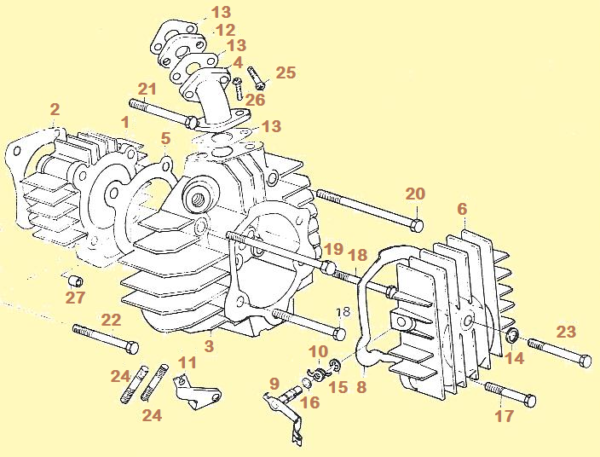 The WTEMCO magneto is similar to a 90mm Bosch magneto, like on Puch mopeds. Many things interchange, like points, condenser, mounting plate. The original points are the older style 3-piece kind, identified by the e-clip. 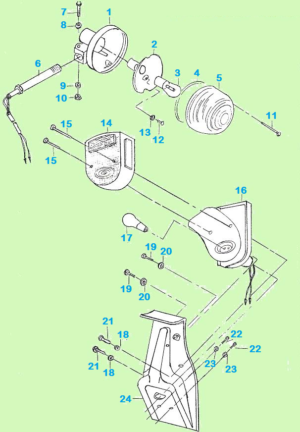 By removing the screw-in post, newer style one-piece Bosch points will replace the older 3-piece ones. 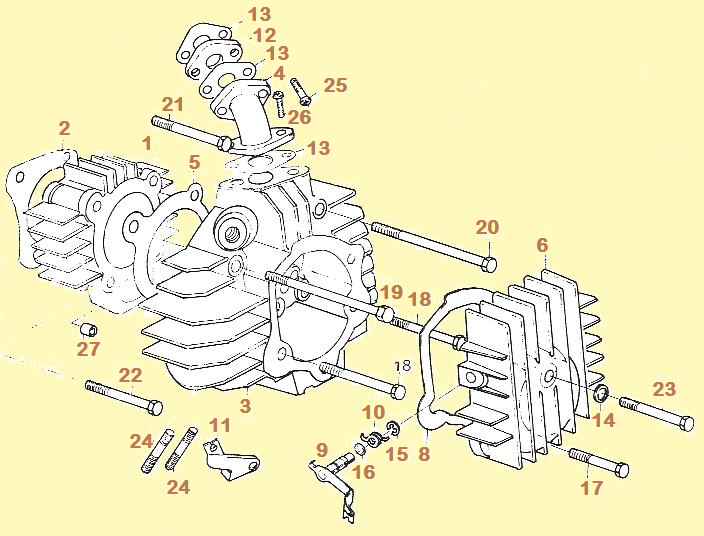 The WTEMCO flywheel timing angle is close to Tomos, which is different than Puch. 02a 1 none D435-upper R upper housing+turn sw.
02b 1 none D435-lower R lower housing+stop sw.
14b 1 none D440-00-50 L lower housing+horn b. These Indian (Taiwan) cables are double-ended (except start cable). 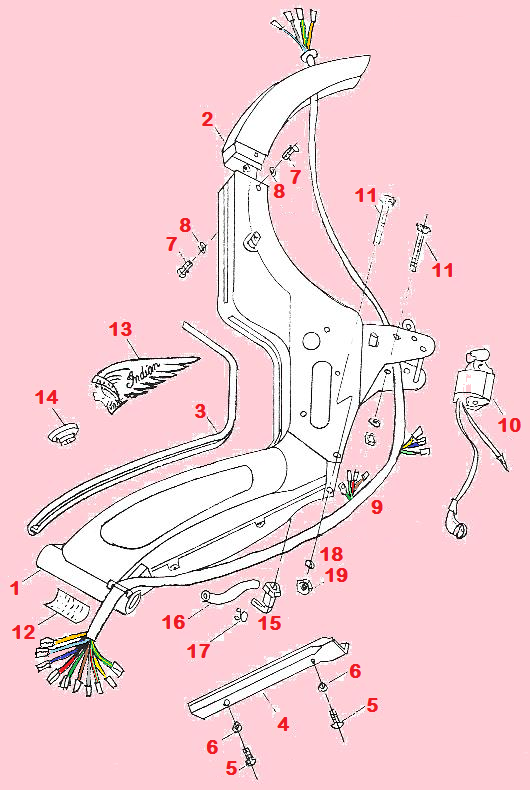 The inner wire and cable pieces are trapped, and cannot be removed. Taiwan Integrated Controls: The lever mounts/housings are also the electrical switch mounts, so these are “integrated” controls. That means the switches and buttons are part of the control housing, and were never sold separately. Indian controls share many things in common with General controls. They look the same. Two main things are different. 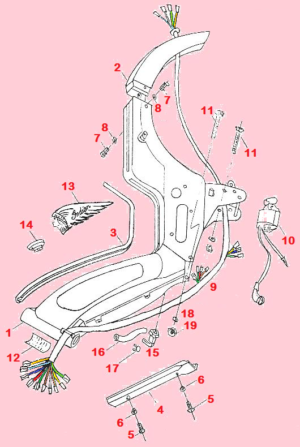 1) General controls have bottomless cable holes with threads (made for adjusters), while Indian controls have thread-less cable holes with bottoms (made for no adjusters). 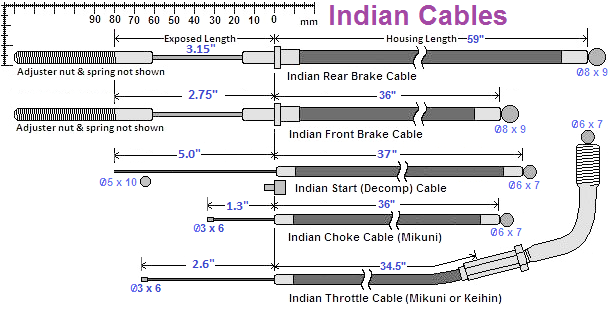 This means Indian and General brake cables have different “exposed lengths”. Indian inner wires stick out 1″ less. 2) General controls have wires with multi-pin connector plugs, while Indian controls have individual bullet connectors. Substitute Controls: To use General controls on an Indian two things have to change. 1. Cable or Cable Hole: Either A) the control has to be modified with a M8-1.25 threaded slotted bottom-plug, and the threads slightly drilled to become smooth (made ready for a no-adjuster cable), or B) the no-adjuster brake cable has to be changed to an adjuster type, with 1″ longer exposed length, and an M8-1.25 slotted adjuster added. The easy way to do that is to add a 1″ metal tube onto the threaded rod at the wheel end. The difficult way is to cut off the upper “ball” end and solder on a new one 1″ closer to the conduit. 2. 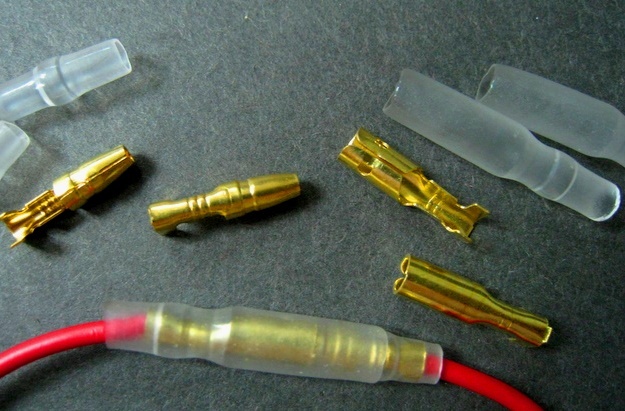 Wire Connectors: The multi-pin plug has to be cut off, and individual male bullet connectors installed onto the wires. Some wire colors are different. 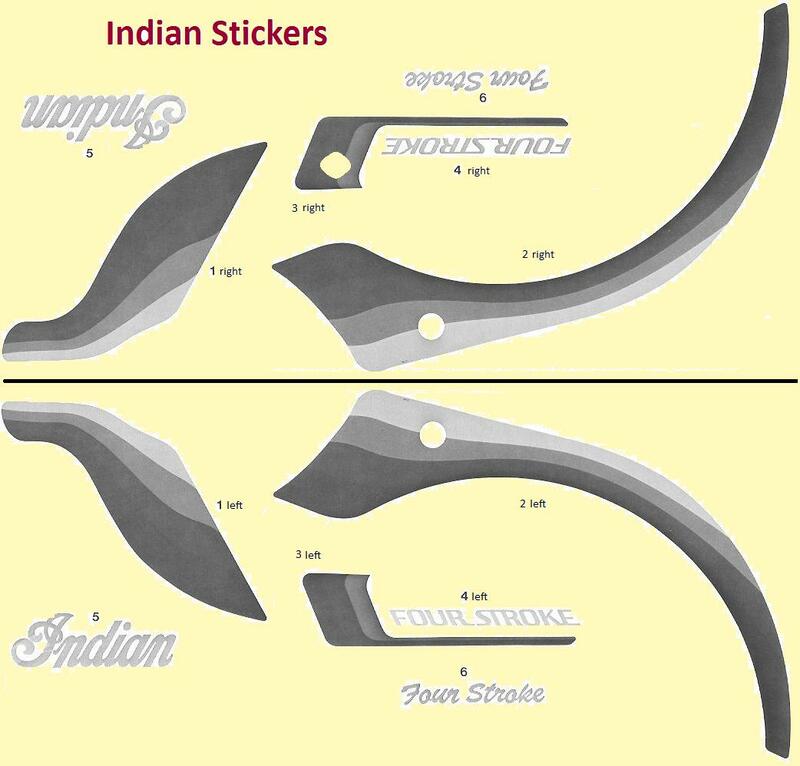 On those colored tape or written labels need to be attached, to make the “General” wires (left – yellow, black, light green, right – light blue, brown, orange, red) become “Indian” ones (left – yellow, gray, purple, right – light blue, brown, orange, blue). 3. 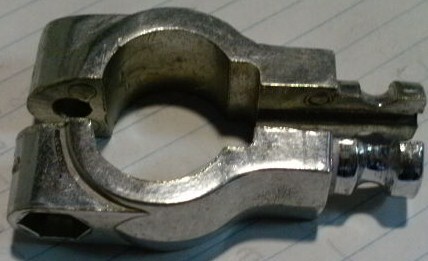 Choke lever for Mikuni Carb: Only only some of the black General right controls have threads for a choke lever. So not all would work for an Indian with Mikuni, without drilling and re-threading. 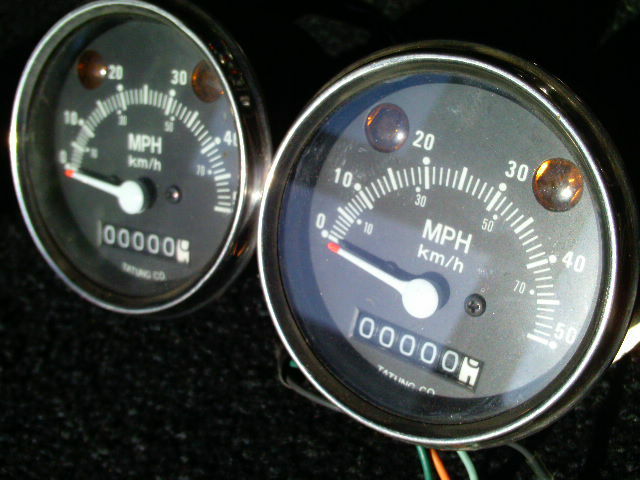 Most of the silver General right controls have choke lever threads. 4. Start lever: Only some of the silver General left controls have mount holes for the start lever mount. So not all of those work for Indian, without drilling. 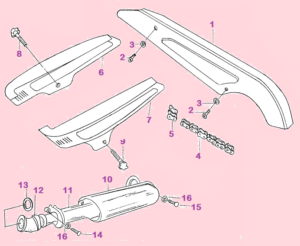 Indian Brake Levers: They’re the same as General, Honda Express and other Taiwan mopeds (but not 70’s Lazer). Special Threads: Screws on Indian controls have special coarse thread M5-0.9 instead of M5-0.8. This was the pre-1970’s Japan Industry Standard (JIS) for 5mm screws. 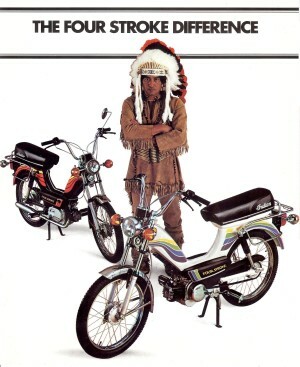 If you ever had a 1960’s Honda or Yamaha you might know this. After about 1969 JIS changed to normal M5-0.8. So Indian and other 1970’s Taiwan controls might be remakes of unknown 1960’s Japanese controls. Left Indian, no wire slot. 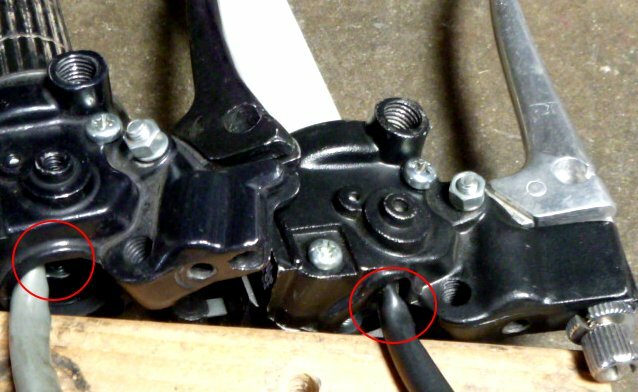 Handlebar Holes: Indian control switch wires run through the inside of the handlebar, but not the brake light switch wires. 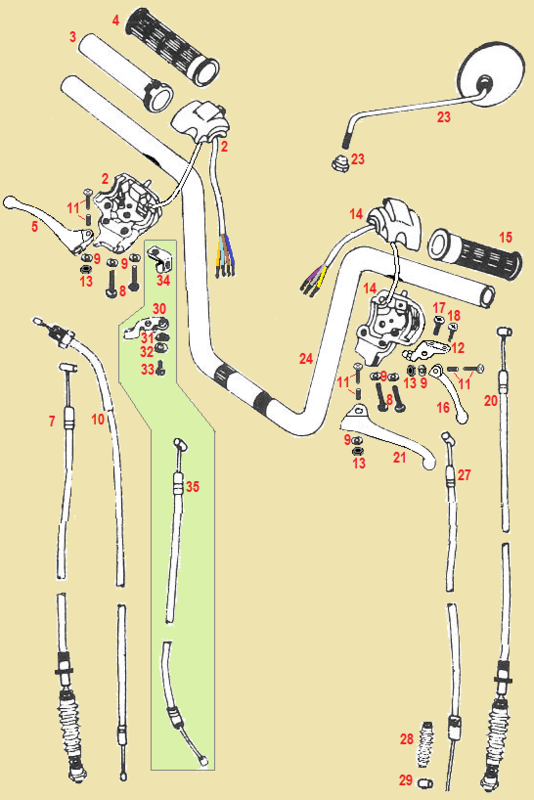 The handlebar has seven holes: 1 – bottom slot where all wires exit, 2 – small side holes for turn signal wires, 2 – top holes for control wires, and 2 – top small holes for control locating pegs. Control wire slots: General-type Taiwan moped controls, made for external switch wires, have wire slots that look like “mouse holes”, to let the wires out. Indian controls do not, but slots can be cut with a Dremmel or disk grinder. 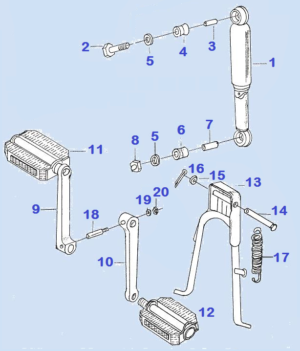 True Hydraulic: The Indian front suspension is hydraulic (oil-dampened) for a smooth ride. Each 24mm outer diameter fork tube holds a maximum of 3 ounces of 20W fork oil. 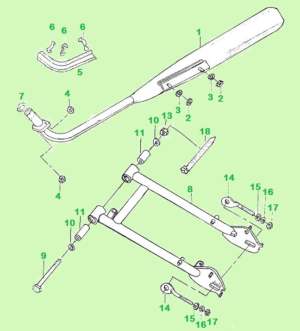 Fork Types: (from 1981 Service Manual) There are two fork types, denoted by the series letter on VIN digit 8. Series A,B,C,E have “type B” fork. 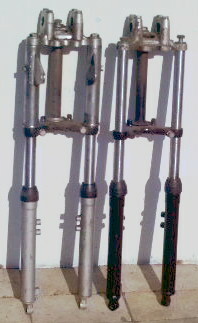 Series D,F,G units have “type A” fork. 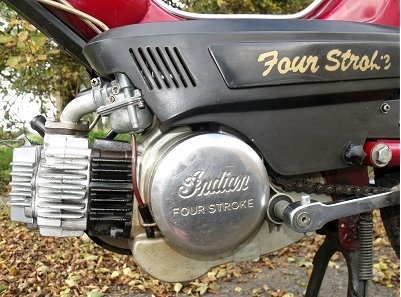 The first Indians made in 1978 had the type A cast iron fork yoke. It was made for the type A fork lock F140-00-50, which did not have an electrical switch. That fork lock had the lock pin in between the mounting screws. 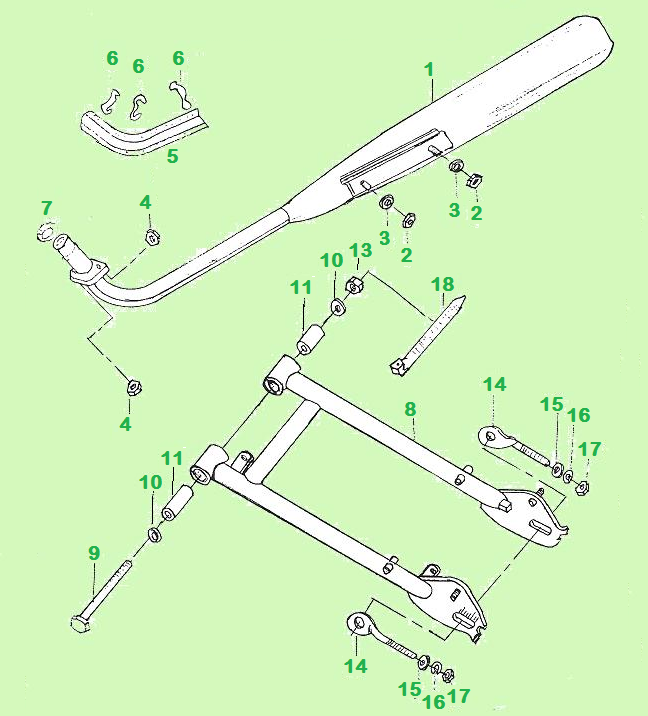 The type A yoke for that can be identified by the 3 holes in a row where the fork lock goes. 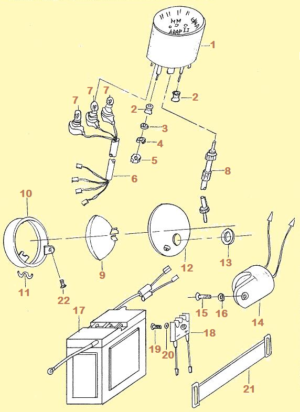 Those early Indians had a battery minus wire with an eyelet connector, that was always grounded to the frame. But anyone could turn on the signals, light up the brake light, or beep the horn. So Indian decided to change the fork lock to one that had a battery off and ignition off switch. The only fork lock they could find had different mounting screws. 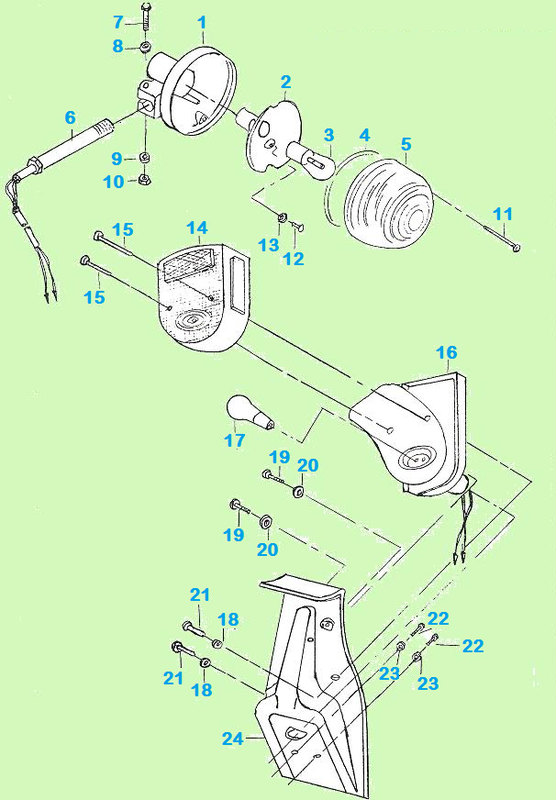 So they had to make a different fork yoke, type B for the type B fork lock F140-00-50 with electrical switch. 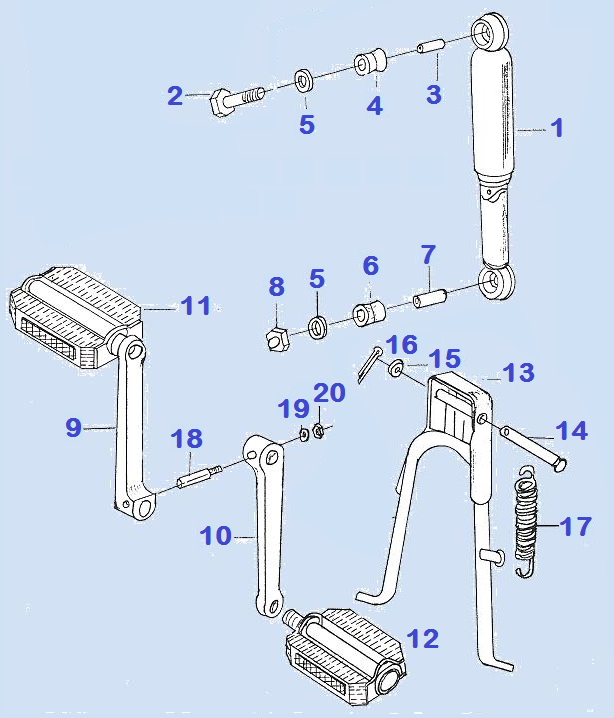 That type B fork yoke can be identified by the 3 holes in a triangle where the fork lock goes. 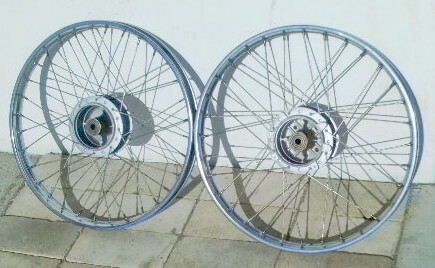 W100W200 Indian 17″ sealed-bearing spoke wheel set, new except for the silver painted hubs are scratched and the spokes are dull. Yuan Ta: Indian spoke wheel hubs and brake plates were made by Yuan Ta. That name is in the cast aluminum. 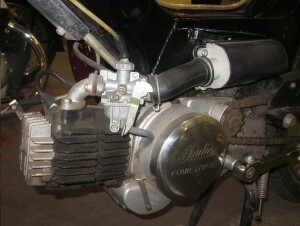 The same Yuan Ta 90mm hubs are also used on AMS and Trac (Dailim) mopeds. 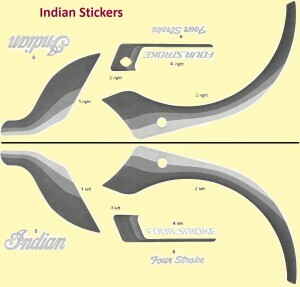 Most Indian brake panels say “Yuan Ta”, but some say “AMI50”. Replacement Spoke Wheels: The 32 hole 17″ chrome rims say “KI 2.00×17”. This is the recommended tire size, but 2.25 is what they come with. 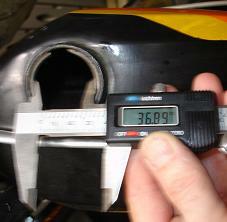 The inner rim width is 1.30, thinner than the mag wheel width of 1.60 inch. 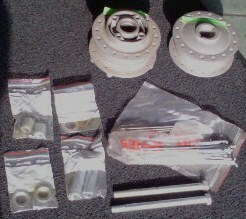 They are sold bare, without axles, axle spacers and brake plates. 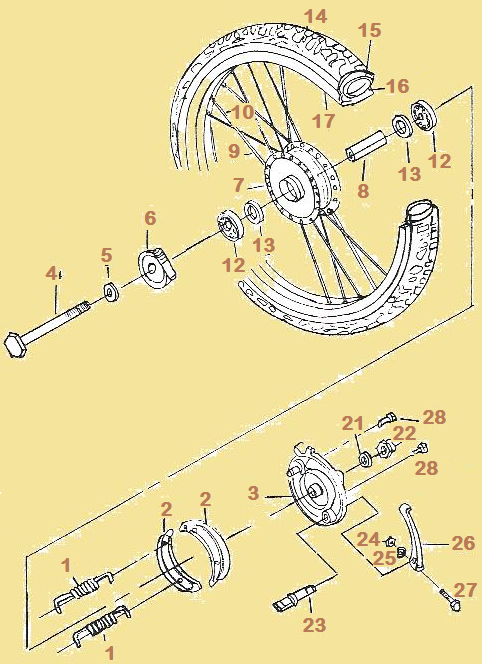 Sm2 and Spoke Interchange: The brake and axle parts are the same on the Sport Mag II and spoke wheels, except the horse shoe spring is for sm2, and dual coil springs are for spoke wheel. That is because the Sm2 wheel center is thicker, and would rub on coil springs. 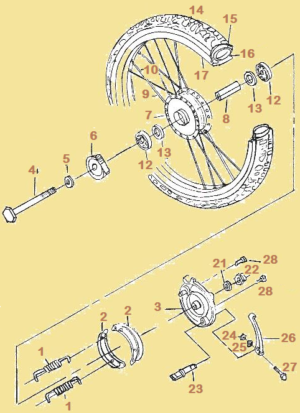 The original brake shoes were the same, except the spring holes are bigger for the horse shoe spring. The horse shoe spring is more difficult to install, but leaves room for a bigger, stronger hub center section. When coil springs rub against the rotating center section they “sing” or “zing” like a violin. The cure is a horse shoe spring. No Sm2 shoes: One issue with the EBC 913 modern replacement brake shoe is the spring holes are fine for the coil springs they are made for, but are not surrounded by enough aluminum to be drilled bigger for a thick U-spring. That is why there is currently no replacement for Sport Mag II brake shoes. Either the spring ends have to be ground smaller, or the holes have to be drilled wider, or some of both. But then there could be failures, if there is not enough strength left. 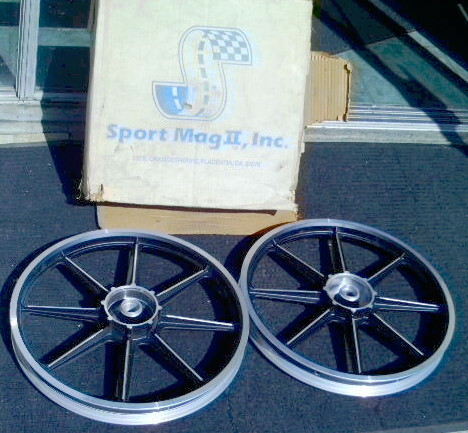 USA-made: Indian 17″ mag wheels were made by Sport Mag II in Placentia, California USA, near Myrons Mopeds. On the wheels that come on the bikes, no markings are in the cast aluminum, but “1.60 x 17” and “DOT” are stamped on the rim. The mags were made in natural silver or coated black with silver trim. The same mags were also sold as accessories for upgrading a spoke wheel to mag. Those say “1.60×17 Sport Mag II DOT-N” and the date (this one 5 80 means May 1980) in the casting. Sprocket Centering Lip: Left, a Yuan Ta rear hub, showing the 42.0mm centering ridge for the sprocket. 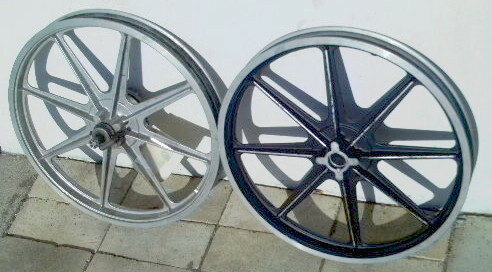 Right, a Sport Mag II rear wheel, also with a 42.0 mm center hole lip. This lip keeps the sprocket centered, running smooth, and makes the bolts last long and not come loose. 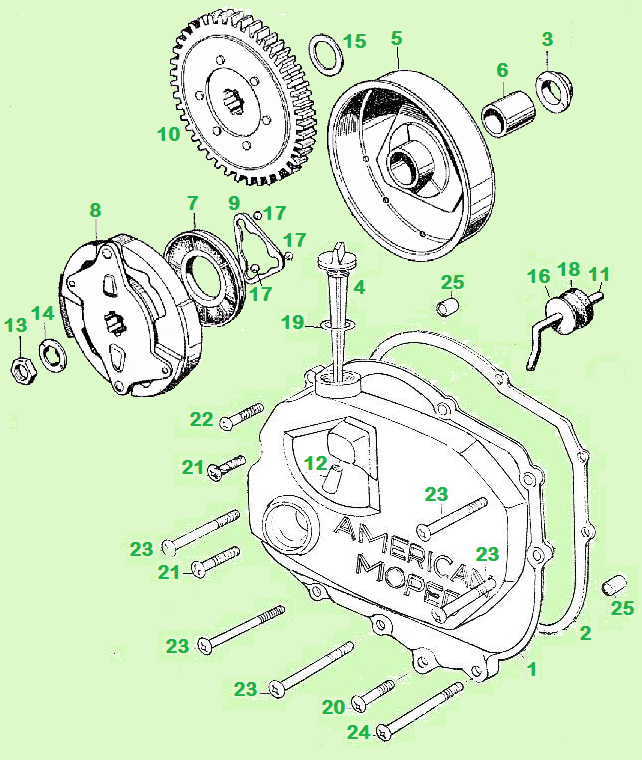 European moped sprocket centering holes are 39.5 or 42.5, too small to fit, or too big to stay centered. This is the label on the Mag Wheel Set box. It was shipped to A.V. Moped on Aug 23 1982 for $2.68. Myron bought out A.V. Moped a few years later. American-made wheels, with history. 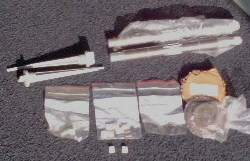 Hardware kit that comes with mag wheel set. 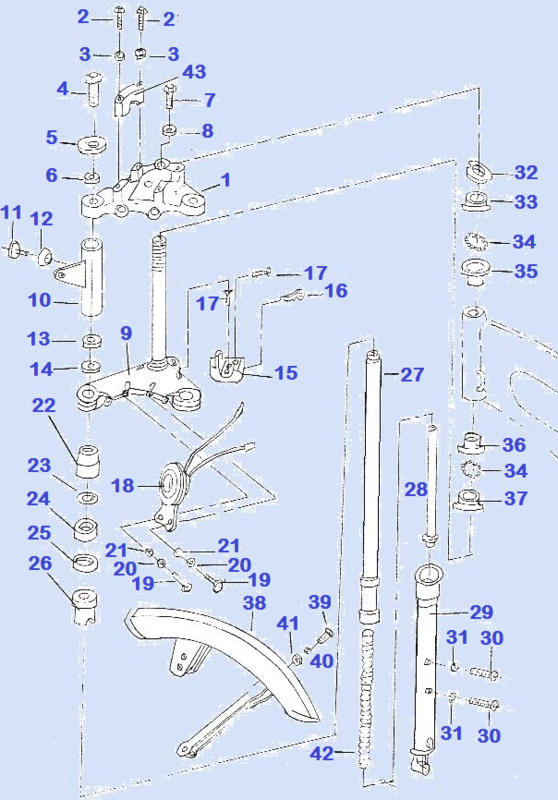 Also in the kit are two horseshoe style brake springs, to replace the coil ones after drilling the (original, not modern EBC613) brake shoe spring holes bigger. Also four 5/16-18 by 3/4 long sprocket bolts thread into the American made aluminum. There once was an instruction sheet but that has been lost. m11 1 none W214-00-50 axle spacer Ø13 Ø18 17? 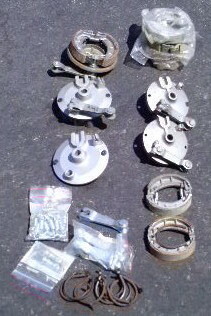 Brakes: In the above right photo, at left are 100mm brakes, at right are 90mm ones. 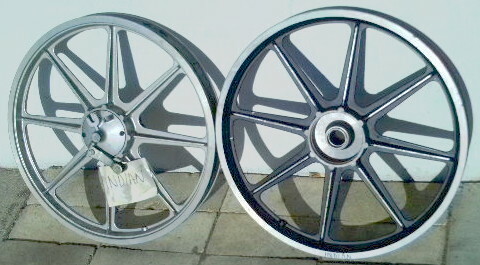 The 100mm brakes are for the 1980-81 Mira snowflake style aluminum wheels. 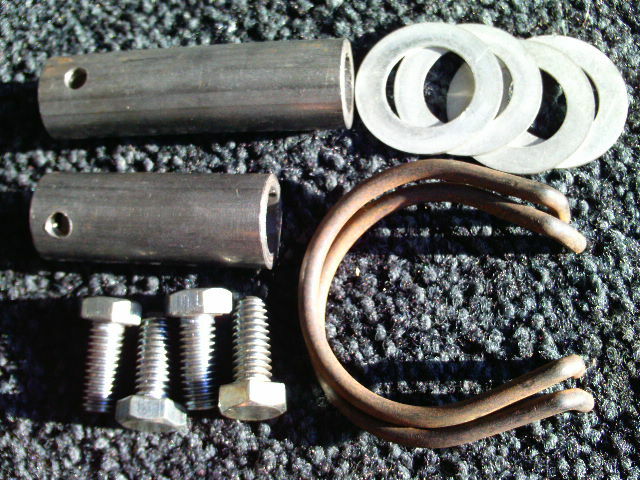 At bottom right is an installed horse shoe brake spring. Above that are dual coil springs installed. The coil springs make it easier to put the brake shoes onto the panel: “fold the taco into a tortilla”. See Service Dept. 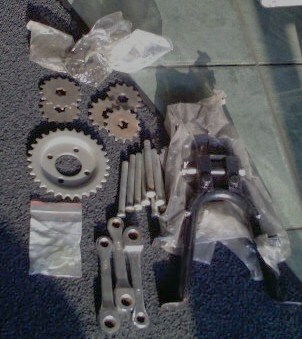 Sprockets: Indian front sprockets fit on many small Honda models, like early Honda 90, but not early Honda 50. They have 6 splines, 17mm inner by 20mm outer diameter. 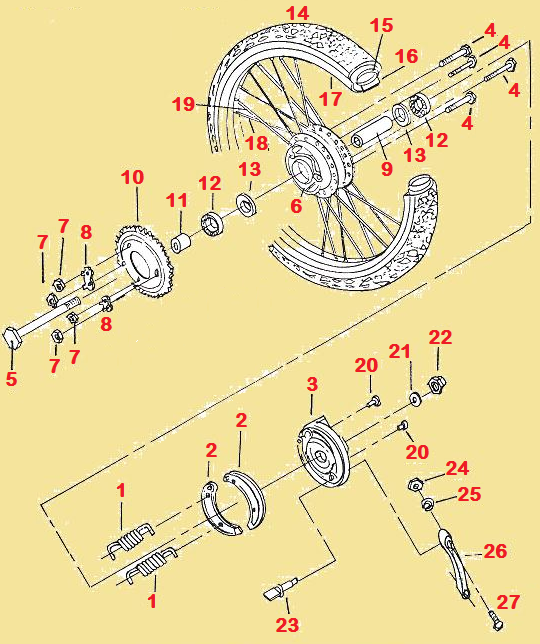 Indian rear sprockets have a 42.0mm centering hole with four 8.5mm bolt holes, spaced 62mm apart, center to center. 634983 substitute petcock: must remove cover! 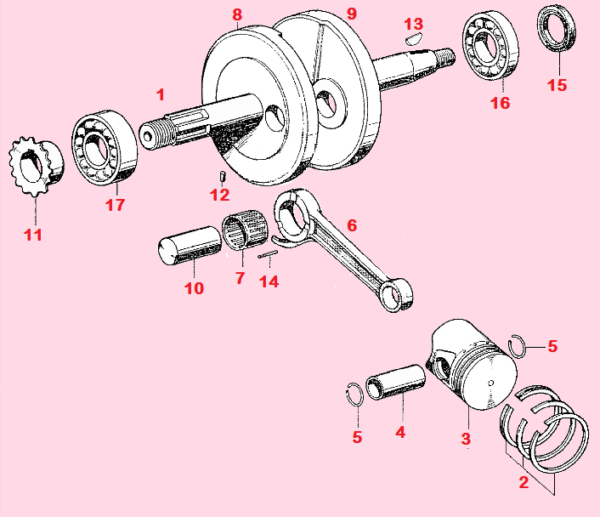 Indian petcock is a M16-1.5-thread side mount. This Honda seal disk fits, with 2 holes widened. Gas Valve: is unique. 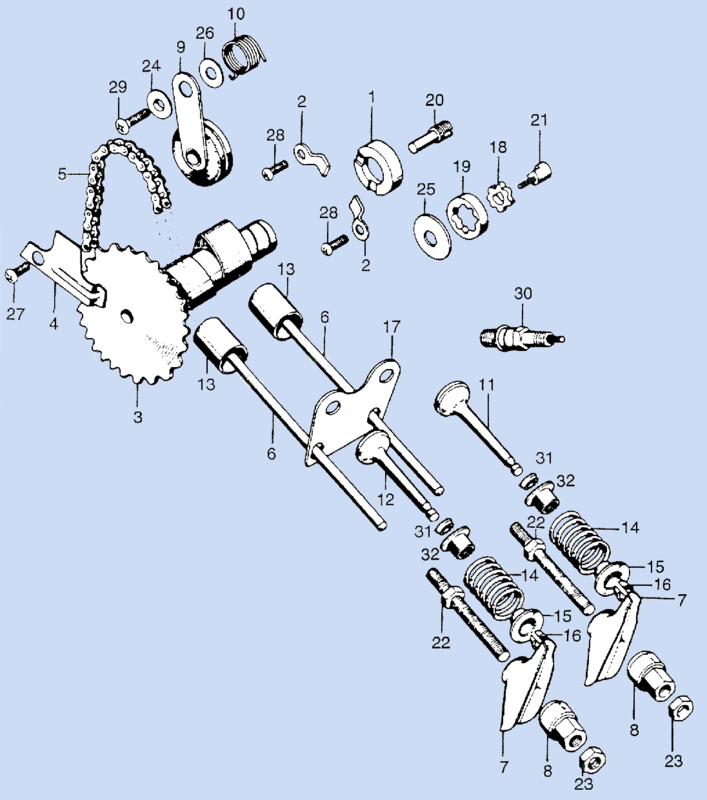 It has the M16-1.5 thread of a 1970’s Honda, but instead of being a more common “up and down” or vertical mount, it is a “sideways” or horizontal mount. The only known substitute is a vertical mount type. Mounted sideways on an Indian, the handle faces upward, instead of outward. Your fingers cannot reach it through the cover hole, made for the original petcock. So the cover has to be removed, to reach the handle. Inner seal disk: Many Indians have leaking gas valves. The metal part is good but the inner rubber disk is bad. There is a new Honda rubber disk, that needs two of it’s little holes widened with a Dremmel type high speed hand tool. It has to be done precise and perfect, or it will leak. Then the original gas valve can be re-used with the side cover in place. 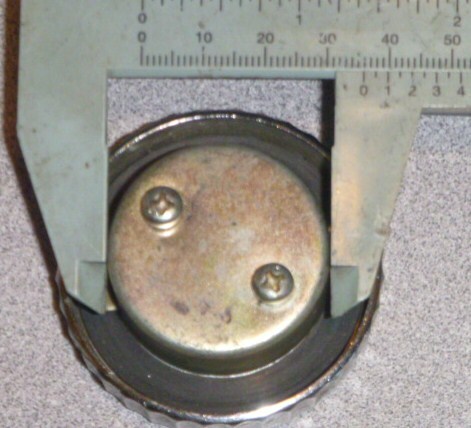 Gas cap: It is a common quarter-turn type with an uncommon size. The gas cap bottom part is 36 mm outer diameter, for gas tank holes 37 mm inner diameter. Almost all other quarter-turn moped gas caps are 28-29 or 38-39 mm outer diameter, for gas tank holes 30 or 40 mm inner diameter. 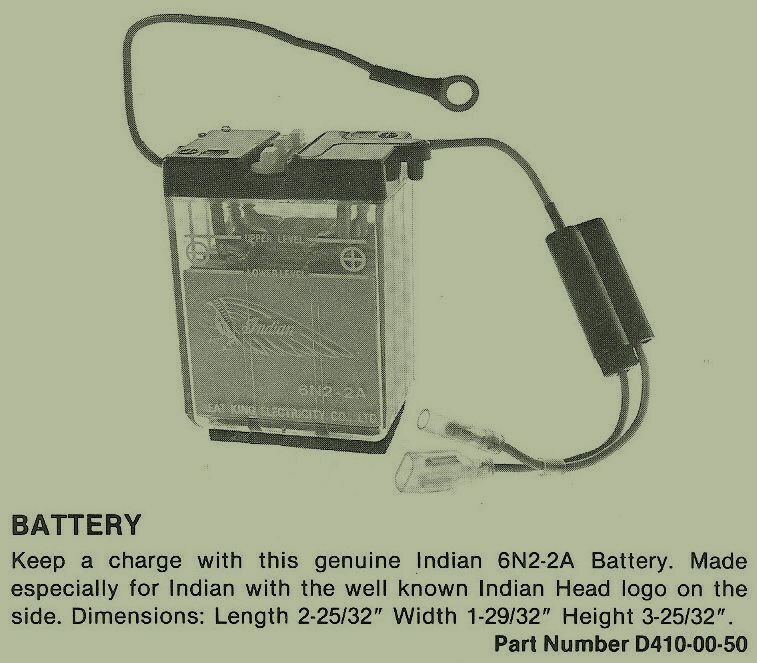 Electrical versions: The first Indian’s batteries had an eyelet black (minus) wire, a permanent ground. But anyone could operate the lights without a key. So in late 1978 they added a key switch to the fork lock. The fork yoke had to change to accommodate it. 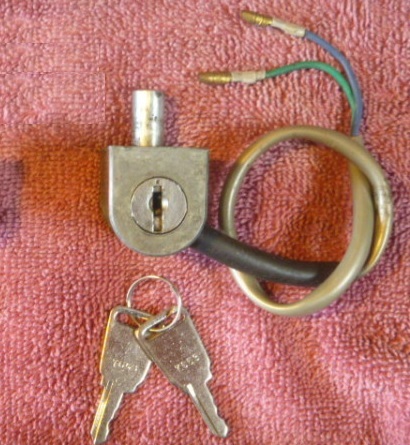 The 1979-81 electric fork lock did two things when the key was removed. 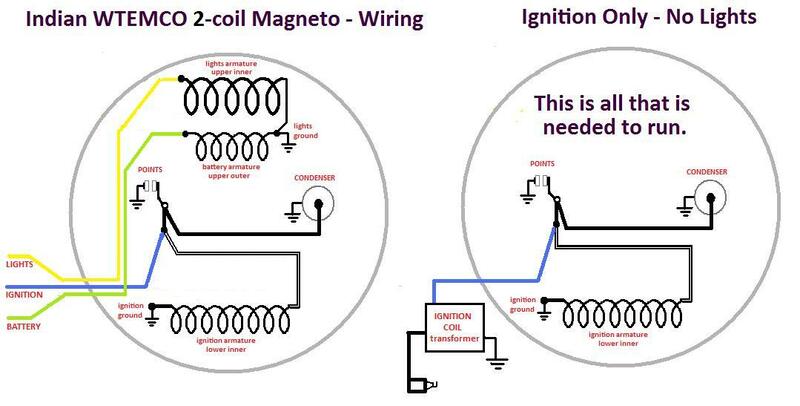 1) shut off the lights and horn (by un-grounding the black battery wire) 2) it also killed/locked the ignition (by grounding the blue ignition wire). The later wiring D437-10-50 has the battery wire and the 2 fork lock wires. 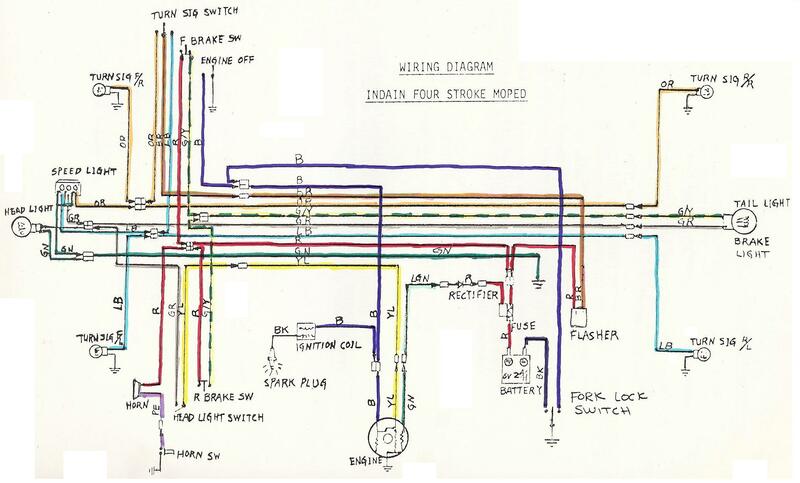 The early wiring harness D437-00-50 did not have those extra three wires. The early-1978 battery had an eyelet-connector minus wire. After late-78 it had a female bullet black (minus) wire. Then the battery could be switched off. 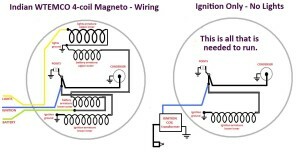 Indian WTEMCO coil substitution: A few things limit the choice of replacement spark coil, all related to mounting, including: 1) bolt hole spacing, 2) bolt size, 3) height above bolts. It looks like some coils could maybe be mounted to the floor plate, by drilling holes in it. 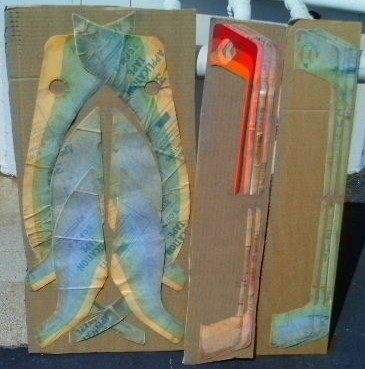 The color stripe stickers have creases and folds where the sticky part has been exposed to air and dust for many years. So in places it might not stick good, and/or it might have a slight bump or ridge in places where it was folded for 20 years. They are sold as is and priced accordingly. The gold script tank and side stickers are also old, but not wrinkled. They peel off the back paper OK, but the front paper sticks and tears. It must be carefully removed piece by piece. 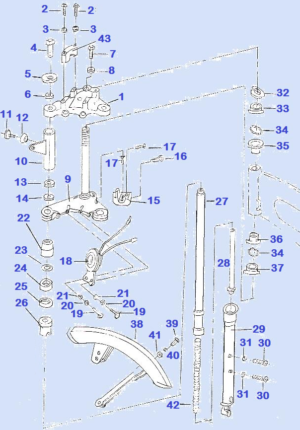 u11 2 none F423-00-50 swing arm bushing Ø10 Ø?? Speedo has good dampening, low wiggle. 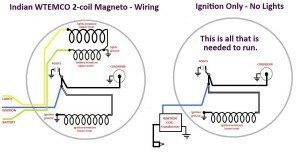 Battery Wires: As mentioned above in the frame section, there is an early and a late wiring version. The early wiring had no shut off key switch. 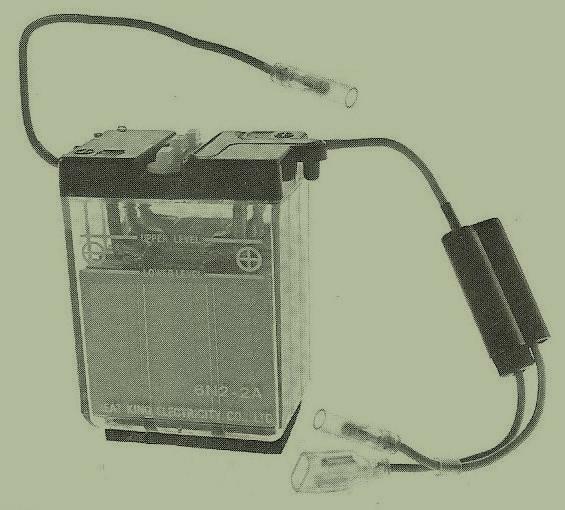 The battery was always grounded/bolted (and thus active or “on”) to the frame . 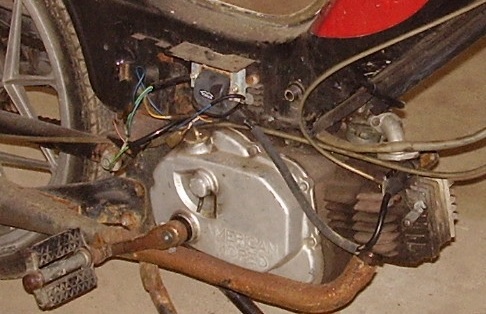 The Indian early 6N2-2A-I1 battery had an eyelet connector on the black wire, an Indian logo on the front, and double female plus single female bullet connectors on the red wire. 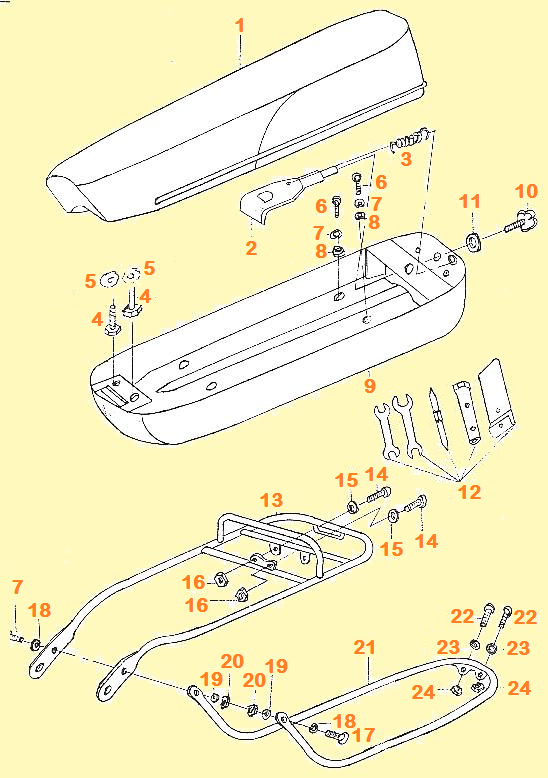 The Indian late 6N2-2A-I2 battery was the same except for a female bullet on the black wire. The grey scale battery (late) image is a edited copy, but the color image below of the wires (late) is real. 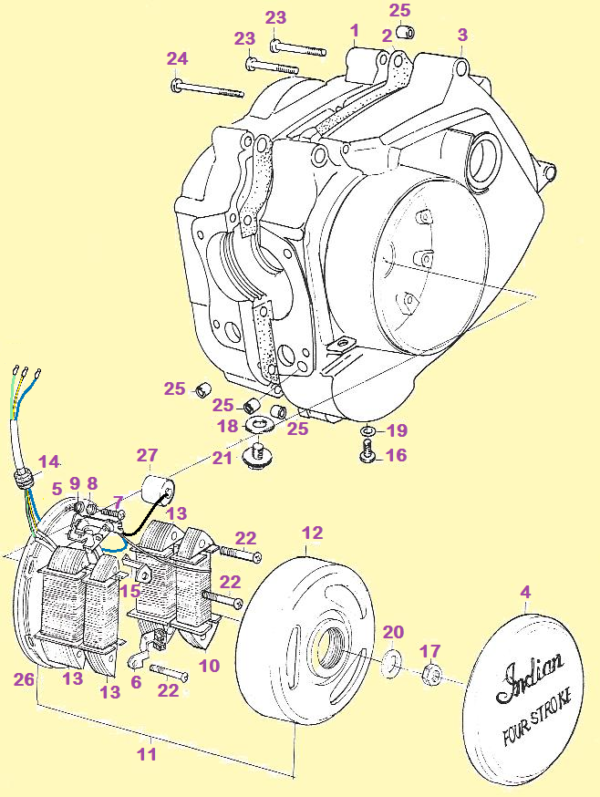 Indian Wires: In the wiring diagram you can see how the fork lock switch was added on to an earlier version, where the battery ground eyelet used to be. The fork lock wire labeled BK and colored black is actually green. 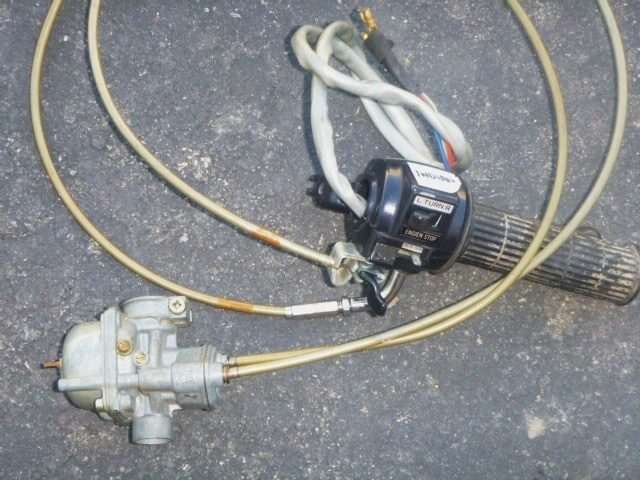 The long BL blue fork lock wire that is shown plugged into the double female bullet above the engine, is actually short and plugs into a single female bullet above the fork lock. So one of the double blue female bullets is unused, as seen above in an actual photo. Rectifier Wires: The square black thing with red and green wires is the (half-wave) rectifier. 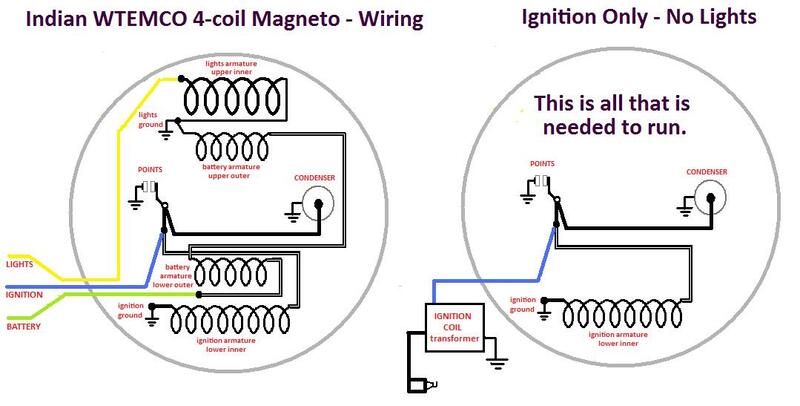 It changes (half of) the AC, from the green wire, to rippled DC at the (+) red wire, for battery charging. 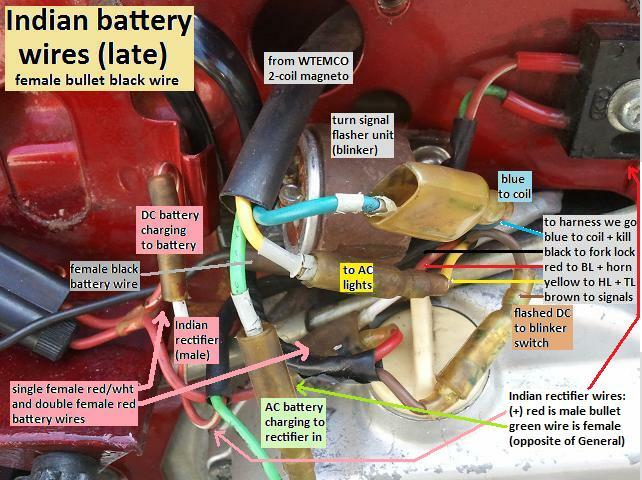 Notice that on the Indian rectifier the (+)red wire is male bullet, (-)green is female bullet. The other Taiwan mopeds with that identical square black rectifier, General, Lazer, AMS, etc, almost have opposite wires. Their (+)red is female blade, and their (-)green is male bullet. Watch out! 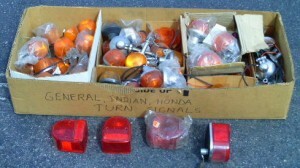 Turn signals: These Indian round turn signals, that clamp on to a round post, are Taiwan copies of early 1970’s Honda ones (made by Stanley). 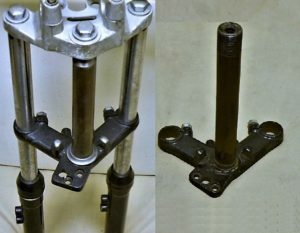 The Stanley ones are metal, not chrome plated plastic, and have a slightly bigger post and clamp diameter. 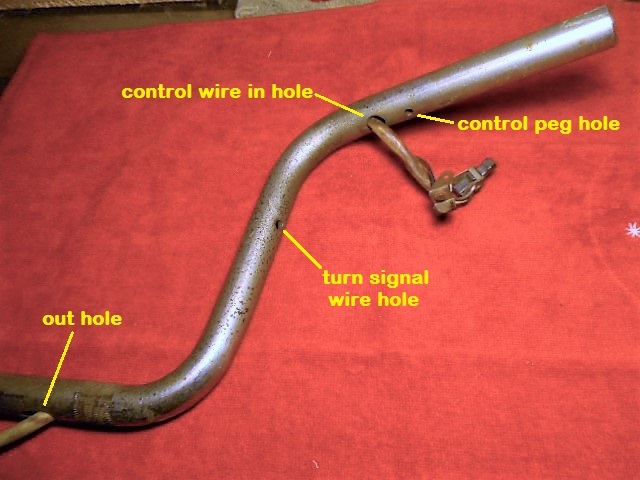 A 1973 Honda (Stanley) turn signal needs a strip of aluminum can, a single layer, to clamp on to a 1979 Taiwan moped turn signal post. Handlebar Mounted Front Turn Signals: These shiny aluminum mounts clamp the front turn signals to the handlebars where they’re protected. Say good bye to broken front signals! They’re not in the 1978-81 Indian Parts Books (by American Moped Associates), but they are in the 1982 Indian Operators Guide (by Leone Accessories – Indian Motor Company), at right. So they are included here in the Indian parts “reunion”. The normal front turn signal chrome posts, with M10 x 1.25 threads, screw into the Taiwan head light body to hold it on. When handlebar mounted turn signals are used, M10 x 1.25 x 20 chrome hex bolts hold the head light on. This also gives a cleaner look, although the signals droop down at an angle (because of the handlebar angle). You are currently browsing the archives for the Indian Parts category.